To be successful in 2019, having an effective content marketing strategy is a must. According to a study conducted by the Content Marketing Institute, companies seeing the most success with their content marketing efforts allocate 40% of their annual marketing budget to content marketing alone, and plan on increasing their content marketing budget in the next 12 months. Knowing exactly what types of content to invest in is key. So, what do you need to be aware of to stay competitive? Here’s a list of the three biggest content marketing trends that will dominate in 2019. 90% of audiences prefer customized content to engage with brands. That's probably why 55% of companies currently leveraging content marketing plan on increasing their budget in 2019. Cheeky, the rate of content production will continue to rise in 2019. Consumers can identify quality content when they see it, which means that brands need to spend more time and money than ever to make sure what they produce stands out. As we all know, video will continue to grow as a way to communicate your message, but what other types of content will perform well in 2019, and why? You can’t discuss content marketing trends in 2019 without taking about good old fashioned blogging. Given it’s powerful yet simple ability to communicate your message to your audience, it’s predicted that blogging will continue to be the single biggest driving force behind content marketing for many years to come. All that being said, what will actually work when it comes to blogging in 2019? Research shows it'll take more than just writing “good content”. 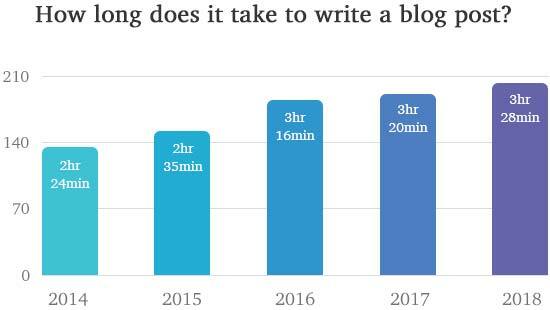 According to research from Orbit Media, since 2014, the average time spent creating a “typical” blog post has increased 44%, with the average post taking around 3.5 hours to write. Notice this is the average time spent on a post. The most successful blog posts require six or more hours to produce! This usually means higher word counts and more research. But that begs the question: What does a typical blog post look like for bloggers seeing results? In 2018, the average word count for a quality blog post hovers around 1,151 words per post. To get a better idea of how crucial long-form content is, 50% of bloggers writing long-form content claim they notice a significant ROI as a direct result. When it comes to the rate of publishing, frequency and consistency still matter. Bloggers posting content on a weekly basis are 2.5x more likely to notice significant results than bloggers that post on a monthly basis. Bloggers leveraging different types of media formats are noticing better results with their posts, be it a decreased bounce rate, more traffic, or a conversion of some kind. In essence, companies that want to see results from their blogging efforts have to raise the bar; fluff posts that lack depth and research will not make a lasting impact on an audience. Content marketing trends show that surveys are a popular method of content creation because they provide unique data for an audience. When used effectively, surveys are a great source of publicity for a company, and they demand less resources to produce than other forms of content. The data from surveys can also be presented in many different forms. For instance, you can frame your results in an infographic, include stats in in-post images, or simply organize your findings in a table within a blog post. From an SEO perspective, surveys are one of the quickest way to gain authoritative links. Journalists eat up shocking data and a compelling headline, and will link back to your survey, making surveys one of the best methods to gaining quality links from high-end news sites. Infographics are still a beloved form of content by bloggers because they communicate information visually and they are easy to share. Indeed, the shareability factor of an infographic makes them an excellent marketing tool. Infographics that truly resonate with an audience will circulate on social media platforms and may even earn you organic links to your website. From an ROI perspective, infographics can increase your site traffic by as much as 12%, which is why 42% of marketers claim that infographics (and other forms of visual content) are the best way to engage with an audience. Given the fact that Google recently improved its Image search, infographics give you yet another way to reach your audience organically. Diversifying the type of content you produce will help you retain your audience. By finding new ways to present your content, be it through a survey, framed in a visual asset like an infographic or data visualization, or simply by writing longer, well-researched long-form blog content, you make an impression on your audience and build trust. Content marketing trends illustrate that SEO is still a high priority for many companies, and will remain so throughout 2019. After all, 93% of all internet traffic comes from search engines. Brands of all shapes and sizes realize the importance of ranking on page one, and are constantly adjusting their content strategies to integrate an SEO approach. By extension, SEO can have a devastating effect on a website’s traffic and revenue if best practices aren’t observed. Indeed, companies need to have one ear to the ground at all times to keep up with Google’s constant algorithm updates. To make sure your website remains in Google’s favor, here are some SEO trends for 2019, and how they will impact your content strategy. Links are still a strong ranking factor, but to get those links, you’ll need quality content. In fact, according to Google’s own Andrey Lipattsev, links and content are still two of the top ranking factors. That being said, there is a relationship of reciprocity between links and content: You create content with an amazing value proposition, and people will link to it in exchange. At the same time, you instinctively link to good content when you see it. So, to build quality links, you must produce quality content. The fact is, what people deem “valuable content” is not what it used to be. Google’s latest core algorithm update has seen to that. In order for your site to retain its rank on search engines, you better be providing expert, authoritative, trustworthy (EAT) content on your site. Adhering to Google’s quality update means upping the ante in terms of what type of content you produce. People will no longer link to just anything. Your content needs to reflect Google’s EAT standard; if it does, in theory it should organically accumulate links. Of course, you’d be kidding yourself if you thought merely creating your content is enough. You still need to promote your content, but expect a greater return only if your content holds value to the intended audience. Research from SEMrush claims that 11.3% of all search results include some form of a Featured Snippet. Featured Snippets steal traffic from the rest of the pages that rank on the first page of the SERPs, including sites that rank number one. To increase your chances of being seen, you need to rank for Featured Snippets. For Paragraph Snippets: Write 40-60 word “blocks” of content that succinctly answer the search query. For List Snippets: Format your list so the each item is an H2 or H3; Google will then reformat those headers into either a bulleted or numerical list on the SERPs. For Table Snippets: Create a well-structured data table that presents data in an organized, easy-to-digest fashion; Google will curate that data into a table on the SERPs. Voice search is a content marketing trend that is on the rise: According to Google, 20% of all mobile queries are voice searches, and 41% of adults perform a voice search at least once a day. To take advantage of this opportunity, you should be optimizing your content for voice search. Google typically shares answers that are 30 words or less for voice queries. Google prefers to share content in Featured Snippets; 40.7% of all voice search answers were pulled from a Featured Snippet. 75% of voice search results rank in the top three for that search query. Websites with an HTTPS protocol are featured 70% of the time on Google Home results pages. The average voice search result page loads in less than five seconds, so optimizing pages to reduce load time is critical. One suggestion to optimizing for voice search is to create unique FAQ pages that contain short, scannable answers to common voice queries. This way, you don’t have to create an entire blog post around ever query; rather, you can target many queries with one comprehensive FAQ page. In order for your content to perform well, and for your site to rank well overall, you need to make sure you’re paying to attention to the Google’s quality standards. Avoid promoting thin or rushed content, and take the time to produce well-written, well-researched pieces that your audience will actually enjoy. 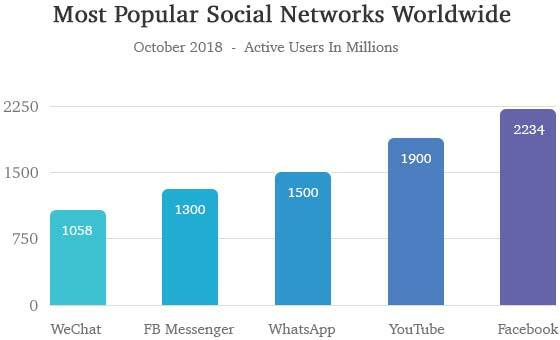 There are currently 3.03 billion active social media users, which is why small-to-medium sized businesses and corporations alike should invest in having a social media presence. At this point, it’s not really an option: If you are a business, your audience expects you to have some form of an online presence, be it a website or a social media page. Video content is a content marketing trend that is growing more popular everyday. According to Cisco, online video content will account for 80% of all online traffic by 2021, and that number will continue to increase going forward. For this reason, investing in quality video content is definitely worth it. So, how do get the most benefit out of video? One way is to take advantage of YouTube. By leveraging YouTube videos, you can simultaneously improve your SEO efforts without even using Google. How? More and more Google searches contain video content. According to Tubular Insights, 55% of all Google keyword searches return at least one video on the search engine results page (SERP), and eight out of 10 of those are a YouTube video. By optimizing your video content for YouTube search, you can bypass Google altogether and still generate more traffic. One way to draw inbound traffic from YouTube is to embed your videos on your own blog. Remember how we said 19% of blog content contains at least one video? This is why. By including video content on your blog, you have the opportunity to tackle SEO with your blog content and draw additional traffic. Influencer marketing is nothing new, but companies are leveraging it on social media by investing in micro influencers. According to Quicksprout, micro influencers have 60% higher engagement rates than celebrity influencers. Not only that, the ROI is also very tangible: Businesses are making $6.50 per every $1 invested on influencer marketing. So why do audiences prefer micro influencers as opposed to traditional celebrity influencers? Your average audience member isn’t famous. People identify more easily with someone similar to them. In some cases, you don’t even have to pay your micro influencers with cash; you can simply send them company swag or free product to incentivize them to keep promoting your brand. Using micro influencers, then, is a no brainer for small businesses that lack the budget to pay a celebrity to review or promote their products. User generated content is basically word-of-mouth marketing. When people like your product, they will share it willingly. According to research from Bright Local, 88% of consumers trust an online review written by another consumer just as much as a referral from someone they know, and 84% of consumers reportedly trust peer recommendations more than paid advertising. So, how do you take advantage of user generated content? One way is to encourage your audience to use branded hashtags and to share content on social platforms. People will also engage with your brand if you feature user photos, especially if you have a large number of followers. When you get your audience to talk about your brand, then your job is simple: lead the conversation. The beautiful part of user generated content is that your source material is already available. You don’t have to do any research; simply pay attention to how your users are responding online, and take advantage of the attention when opportunity presents itself. 52% of small business owners post on social media on a daily basis. Rather than posting because you know it’s necessary, find innovative ways to engage with your audience. The majority of social media users are on their phones several hours a day, so why not bring your content to them? After considering the big content marketing trends in 2019, you may feel overwhelmed. The competition has increased dramatically. Writing good content just isn’t good enough anymore. It has to be unique, targeted, and creative - and all that takes time. Yes, the internet is a crowded space, but you can increase your brand awareness by simply paying attention to content trends and adjusting your strategy accordingly. To learn more about the latest content marketing trends and the future of content marketing, check out our white paper, "What is Content Marketing? And Why It's So Important."